FREE Webinar Series: View recorded webinars. This series is proudly supported by Social Entrepreneurs Ireland, National Centre for Technology in Education, the Irish Centre for Talented Youth. More . . .
Everybody knows a bright child who works hard and is considered a high achiever in school. Typically these children are in the top 10 to 15% of intellectual ability; but what of the children who are in the top 5% category and above? It's this group that is sometimes referred to as gifted, talented or exceptionally able. These children have enormous learning potential, but they stand out from their peers in three key areas; they learn faster, earlier and differently. In addition there is a growing population of children in Ireland with dual exceptionality, i.e. their intellectual ability is often in the top 5% or above but they also have mild to severe learning challenges or sometimes profound disabilities. So, what does the future hold for Ireland's gifted kids and their families? Does an exceptionally bright child mean an exceptionally bright future? Not necessarily. Parenting in itself can be daunting but parenting a "gifted" child can be incredibly challenging. Unlike many other countries there are scant resources available in Ireland for exceptionally able kids; yet, there are estimated to be over 27,000 children who fit the profile of "giftedness" in this country. (See the S.E.S.S. Article on Gifted & Talented Children - updated CTYI 2010) These children often struggle in school, feel isolated and find it difficult to "fit" in with both their teachers and peers. This website has been developed by a voluntary group of Irish parents of exceptionally able children. It is our aim to help other parents and teachers to find the information, support and advice that they may need. Exceptionally able and twice exceptional children can come from all socio-economic groups and from all parts of the country. It is the ethos of Giftedkids that all children, regardless of their home circumstances, should have equal access to an appropriate education, specific to their individual educational and unique social/emotional needs. Is My Child Gifted? Trying to determine whether your child is gifted can be difficult; especially if it is your first child, as you have nothing really to measure against. Often it's other people, sometimes outside of the family, who will bring your child's talent to your attention. You may feel that your child is just simply a clever kid. Usually though, there will be tell tale signs and you'll notice that your child behaves in a different way pretty early on, even before he or she starts school. . .
Giftedness - Myths & Misconceptions The biggest myth about intellectually able kids is that they need no help what so ever in school! As they already seem to know it all, it's only their own laziness that stops them from achieving. Everything comes easier to them; they're assured a place of the top of the class. Their future is bright with no trouble sitting exams; they sail through both primary and secondary school and are assured a place at a top university doing the course of their choice! If only. School is a veritable mindfield for gifted kids and their parents. These children often struggle to fit in with both teachers and other pupils. . .
Getting Your Child Assessed Why should you get your child assessed? Firstly, not all children need to be assessed educationally; however it's vital for those children who, for whatever reason, are struggling in school with the normal curriculum. The advice from the Department of Education and Science around psychological assessment for children is that parents should be informed by the school about any difficulties a child may have, well before it's necessary to bring an Educational Psychologist onboard. In their view supplementary teaching should be tried prior to any intervention. Sounds like good advice but the reality is that there is a lot of pressure on the average primary school teacher, especially with large, overcrowded classes of pupils with varying abilities and languages. Understandably it can be difficult for the teacher to flag a child's difficulties. . . Advocacy in Action! What does Giftedkids.ie do? We launched our pilot webinar series on January 28th 2010 with "Characteristics of the Exceptionally Able – Faster, Earlier, Differently”, presented by Margaret Keane and Anna Giblin. Supported by Social Entrepreneurs Ireland and NCTE these webinars are free to teachers and parents.The purpose of this series is to raise awareness of issues affecting exceptionally able and twice exceptional children amongst teachers, parents and the general public. 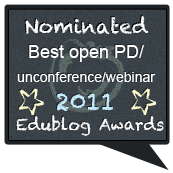 The series was shortlisted for the Edublogs Awards Best Webinar Series 2012. We have also run a highly successful 3D immsersive technology pilot project based in Carlow Gaelscoil.. 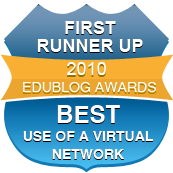 The project was placed as First Runner Up in the Edublog Awards 2010. The success of this pilot has led to the formation of MissionV Education Limited, a not for profit organisation specialising in the use of game based learning and virtual worlds technology for the support of primary and post-primary students; particularly those who are at risk of significantly underachieving and those with high potential. MissionV has been funded by the National Centre for Technology in Education and DSE, Discover Science & Engineering. MissionV has also provided an online virtual learning platform for CTYI's Centre for Academic Achievement. We also support Irish Centre for Talented Youth initiatives and projects and provide speakers on gifted issues on request. 2011 saw the launch of our new parent and teacher blog "Fidget Jones Diary", a frank and sometimes tongue in cheek look at the realities of parenting or teaching an exceptionally able or twice exceptional child in Ireland. The World Council for Gifted and Talented Children invite you to take part in the 20th anniversary conference- celebrating giftedness and creativity- which will be taking place in Louisville, Kentucky, USA this year from Aug. 10th to 14th. The call for papers/submissions will end on May 25th, so don't miss out!